Learn the basics of guitar construction and how different design features distinguish a guitar’s sound. The guitar has shaped the history of music for hundreds of years, with its origins dating as far back as the 16th century. Today, the guitar is used across all styles of music and has become a staple of musicians and songwriters. An acoustic guitar is designed to produce sound without amplification. These guitars are used across many genres of music, but are especially popular with singer-songwriters, country and folk musicians, and classical or fingerstyle players. Acoustic guitars are made in steel-string and nylon-string varieties, and can be equipped with a pickup or microphone so the sound can be amplified for recordings or stage performances. Electric guitars use magnets to detect and amplify the vibration of the strings as they are played. 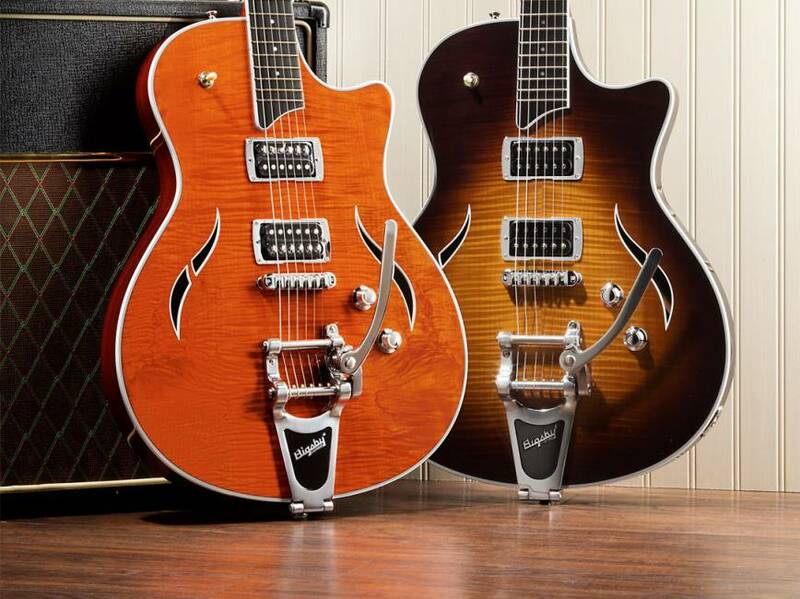 There are thousands of varieties of electric guitars, from the modern solidbody to the older archtop, hollowbody style. Electric guitars are popular in many genres of music, especially rock, metal, blues, and pop. The guitar is a complex instrument built from delicate, precisely cut and arranged materials. Each component of the guitar can have an effect on its sound and playability. 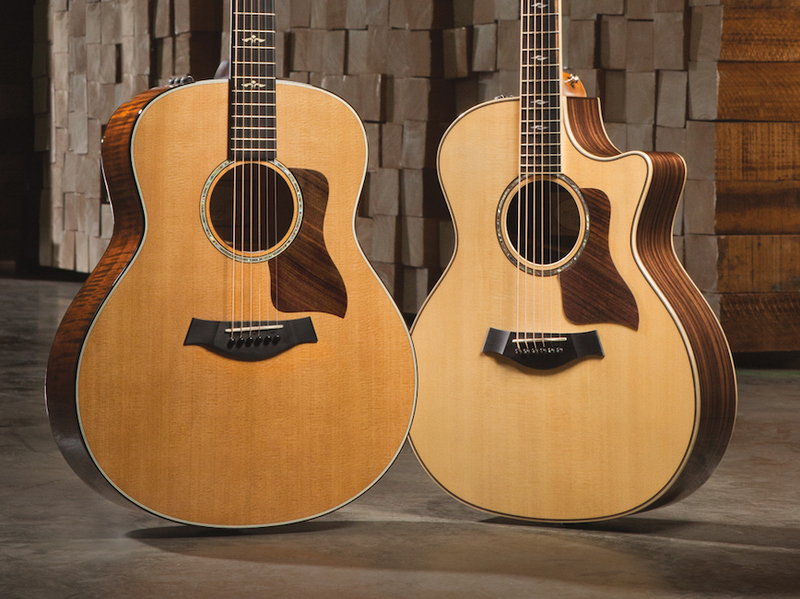 Spruce: A popular choice for acoustic guitar tops. Its combination of rigidity and flexibility allows it to be set in motion easily by the vibrating strings and project a clear tone. Rosewood: Often used for the back and sides of acoustic guitars. It produces a rich musical sound with a broad tonal range, from deep lows to sparkling highs. Mahogany: Also commonly used for acoustic guitar backs and sides, and often necks. It has a clear, focused sound with an emphasis on the midrange frequencies. Maple: Used on both acoustic and electric guitars. A dense wood, it produces a clear, focused, often bright sound with a fast note decay. Solid wood: When we say a piece of wood in a guitar is “solid,” we mean it consists of one piece of wood through its thickness, and is not layered together for strength or durability. Typically, solid wood resonates better than layered wood and is usually found in high-quality instruments. Layered wood: Often used in the construction of electric and budget-friendly acoustic guitars, layered wood provides durability and structure at a lower price than solid wood. Guitars come in many shapes and sizes, each designed to provide a different sound and feel for the player. Shape is especially important for acoustic guitars, since the body must amplify the vibration of the strings without the aid of electronics (although a pickup can be added for amplified playing applications). Small body shapes: Small body shapes like concert guitars and parlor guitars provide a more physically comfortable playing experience and are popular among beginners and players of smaller stature. They also usually project an articulate sound with clear treble notes fewer overtones than a big-bodied guitar. They often make a good choice for recording applications because their sound mixes clearly with other tracks without taking up too much sonic space. Medium body shapes: There are several mid-sized guitar shapes, the most prominent of which are the dreadnought and the Grand Auditorium, which Taylor developed and introduced to the music world in 1994. Guitarists prize these instruments for their versatility, as their balance of clear high tones, a punchy midrange, and warm low end performs comfortably across many styles of music and playing environments. Large body shapes: Larger guitar shapes like the grand orchestra and jumbo produce a deeper sound that projects with more volume, low-end power, and overall sustain than a small-body guitar. For some players, the bigger dimensions can make this type of acoustic guitar more physically cumbersome to play. Electric body shapes: Electric guitars also come in many sizes and shapes, though this is a less important factor in choosing an electric guitar, since most of the sound comes from the guitar’s electronics. One physical consideration, though, especially with solidbody electrics, can be the weight of the body, which can vary depending on the type of wood used. Luthiery, or the field of building and repairing stringed instruments, has existed for centuries. Construction methods for new guitars have been developed by numerous manufacturers and luthiers, but the basic design remains essentially the same: a set of strings is tightened across a body and amplified either acoustically or electrically to produce sound. The two most basic components of a guitar are the body and the neck. The neck is joined to the body, and the strings run from the far end of the neck (opposite the body) to somewhere near the middle of the body’s lower bout, where they are anchored to the guitar top. - Top/soundboard: The front-facing surface, which usually features a soundhole in the center. The top works like a speaker cone for the vibrating strings, and its flexing movement helps set the air inside the guitar body in motion. - Back and sides: These usually are the same species and provide the structural rigidity, which contributes to sustain (how long the notes resonate audibly before dropping off). Neck: Guitar necks come in many shapes and profiles. The Taylor neck is a popular choice among acoustic guitar players for its comfort and playability. Headstock: Also referred to as the peghead, it’s the part of the neck (the head) where the strings connect to tuning machines, which adjust the pitch of each string. Fretboard: The piece of wood (or other material) glued to the front of the neck that holds the frets in place. Electronics: While all electric guitars incorporate at least one magnetic pickup to amplify its sound, acoustic guitars often need to be retrofitted with pickups. However, many acoustic guitars now come with electronics pre-installed, such as the Taylor ES2 pickup. Cutaway: Many acoustic guitars have a cutaway where the neck meets the body. This allows the player to access higher frets. Cutaways are most commonly found in acoustic-electric guitars. Accessories: Things like high-quality tuning machines, strap locks, and good strings can enhance the sound and overall performance of a guitar. Aesthetic details: Many guitars are decorated with extra visual flourishes, including fretboard inlays, binding, rosette, and a pickguard. These details generally don’t change the sound of the guitar. The final step in the production of most guitars is applying the finish, which adds visual appeal while providing some protection for the wood. Most guitars are finished with a nitrocellulose or polyurethane gloss, though many guitars are available in satin or matte finishes. Electric guitars come in an almost infinite variety of colors and finishes. Acoustic guitars tend to be more visually similar, though you’ll find options like transparent colors and sunburst finishes that add color while highlighting the grain of the wood. Buying a guitar can be a challenging experience if you’re a beginner. Use these resources to help you narrow down your choice and select the right guitar for your music taste, playing style, and ability level. This guide will help you consider all the factors so that you can choose the right guitar for you. Before you purchase, take a moment to use these questions to help you discover your musical needs. We’ll help you get your feet wet and learn the basics so that you can start on solid ground.